← 268. Edinburgh mornings 15: It’s a haar life. (13 Apr. 18). This “Edinburgh morning” actually concerns events from the afternoon on Saturday just past (21/04). I’ve fudged the timeline to fit the name of the series. I know it’s unforgivable. I claim artistic licence. There’s been a clutch of these come along together in the past week or two so I think a heading of their own on the menu is the way to go soon. 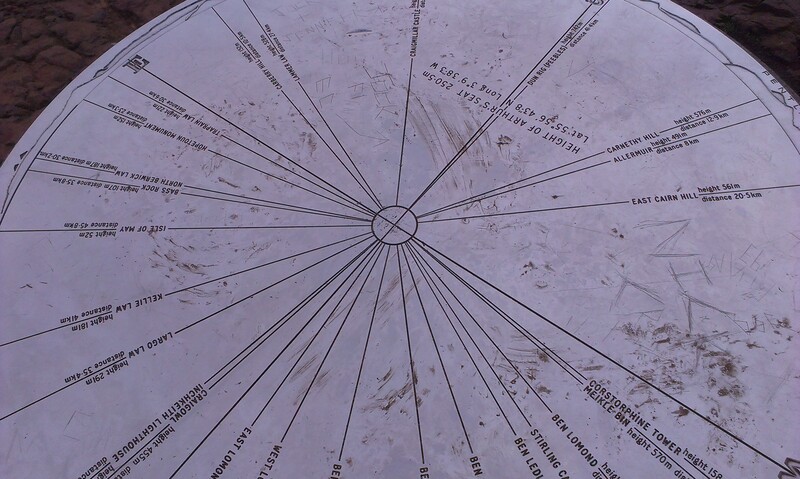 The days initial target, the peak of Arthur’s seat, would have shown us this metal disc which gives a line of sight to various landmarks. It was a day made by the warm camaraderie of genuinely shared time. Comfortable and relaxed and unhurried it was as the best times spent with friends are. It was one of those rare times when I was appreciative of the moment as it happened. This entry was posted in Lyrics & poems and tagged Arthur's seat, Edinburgh, friendship, morning, poetry, Writing. Bookmark the permalink.